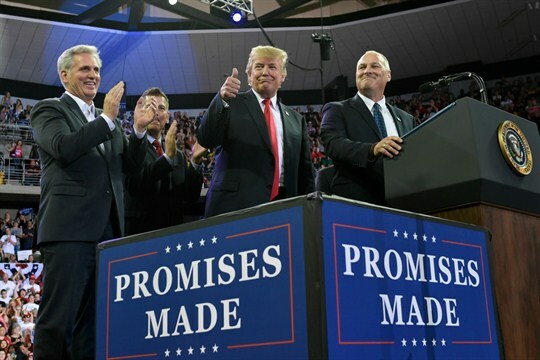 President Donald Trump shares the stage with Pete Stauber, right, a Republican congressional candidate, and House Majority Leader Kevin McCarthy, left, during a rally in Duluth, Minn., June 20, 2018 (AP photo by Susan Walsh). To whatever extent it is possible to become accustomed to the president of a major liberal democracy continuously lying, day after day, the world has grown more or less used to President Donald Trump’s practice of incessantly spraying his unique stream of falsehoods across social media, political rallies and assorted public events. Editors at major media organizations have grappled with the complications of deciding whether or when to label the president’s untruths as “lies,” noting that a lie requires a conscious intention to deceive and knowledge that a statement is incorrect—and it is not always clear that is the case when Trump fires off one of his regular whoppers.